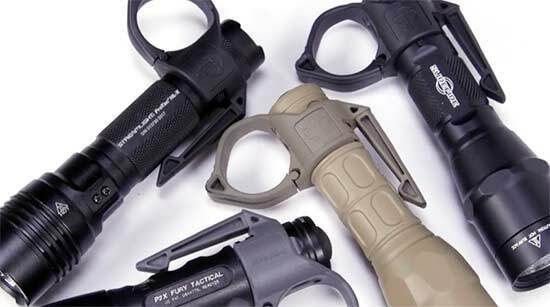 The SwitchBack 2.0 flashlight ring from Thyrm fits a variety of tactical flashlights and is available in three colors. Anybody who has tried, or is learning, to hold a tactical flashlight in his/her weak hand while training a handgun or long gun on a target has already figured out this is not as simple as it looks on television or in a video. But Thyrm LLC, a California company, has developed a finger ring that fits between the tailcap and body of a flashlight for a steady hold. It’s an upgrade of the original SwitchBack model and is sized to fit a 1-inch diameter flashlight. It’s a rather clever design with a finger ring and pocket clip, and a release on the finger ring lets go under heavy pressure, but it can be reset. Available in black, tan/Flat Dark Earth or Urban Gray, the SwitchBack 2.0 large flashlight ring is compatible with a wide range of flashlights including models from Surefire, Streamlight, Pelican, Nitecore and others. This device allows the user to retain a flashlight while drawing or reloading, shooting with a two-hand hold and even working through a malfunction. The pocket clip is strong enough to hold not only in a pocket, but in a pouch made from MOLLE/PALS webbing or heavy nylon as well. It’s also got a wide thumb rest that enhances the hold while shooting or just holding on target. A flashlight ring comes in handy for a variety of activities, and the SwitchBack 2.0 will earn its keep through a variety of applications. This accessory isn’t just for shooters. It has a wide range of applications for all sorts of outdoor activities ranging from auto maintenance to camping, backpacking, predator hunting, search and rescue and even crawling around under a house or workshop. Built from a tough polymer, the SwitchBack 2.0 is impervious to any changes in weather or temperature conditions. The year-round tool mounts quickly and stays out of the way until a flashlight is needed. It’s made right here in the USA and carries an MRSP of $19.95. Thyrm doesn’t just produce flashlight rings. Other accessories, including storage containers for batteries, plus the CLENS lens protector that keeps dust and dirt off the flashlight lens are available.